KJV Luke 14:16 Then said he unto him, A certain man made a great supper, and bade many: 17 And sent his servant at supper time to say to them that were bidden, Come; for all things are now ready. One thing should strike us about the Great Feast Parable - this is a concrete comparison and not an abstract one. Objections to Biblical teaching are abstract and often use newly minted words. But Jesus taught with concrete examples from ordinary life and His own Creation. If we cannot learn from Creation, then we might pay attention to parallels with ordinary life. No one had trouble with Holy Communion until the Reformation, when those who opposed Luther found an agenda they could promote. Zwingli and later Calvin wrote against it, and others did as well. The idea was always to make Holy Communion only symbolic, just a ritual. In doing so, they thought they refuted Roman dogma. But they were like the man, as Luther said, who saw his brother attacked by a bear. He grabbed his knife and stabbed, killing his brother instead of the bear. So these supposed anti-Romanists attack the wrong thing and effectively kill the efficacy and purpose of the Lord's Supper. Everyone can see this is a parable, one with everyday comparisons. "A certain man" signals that this is a parable. As a teaching of Jesus in His own words, we should pay attention to it. When people appeal to authority as a logical fallacy, they pick their own authority and skip the true source, the Word of God, which judges all authorities. In addition, they use a reverse version of this, saying, "I don't agree with you." I have said to many, "But that does not matter. Do you agree with the Scriptures and as a Lutheran, with the Book of Concord?" Secondly, as a parable, this ranks as teaching by Jesus that was explained thoroughly to His disciples. It was not supposed to be so obvious that any dabbler could deal with it. A certain man made a great supper, and bade many: 17 And sent his servant at supper time to say to them that were bidden, Come; for all things are now ready. We can all relate to this, because it is saying that the Gospel is a gracious invitation. Who would not accept an invitation sent when they are hungry - at supper time? The Jewish people hungered for righteousness. They knew the Scriptures but often missed the main point. And yet, at the time of Jesus, there was so much longing, so much hunger, that they flocked to Him to hear the Word from him rather than the scribes and Pharisees. This is a parallel to what the Fourth Gospel states - that Jesus came to His own people, and they did not receive him (believe in Him). The rejection of the invitation is shown to be ridiculous, because each excuse is shallow and ridiculous. One has to go look at some land. One has to test-drive his oxen. The last one has just married. As Luther noted, this parable is a rebuke to the Jewish leader who tried to show off and preach better than Jesus. So these people who excuse themselves are the Jews invited to believe ever since Abraham, since that patriarch was and is the model of justifying faith. 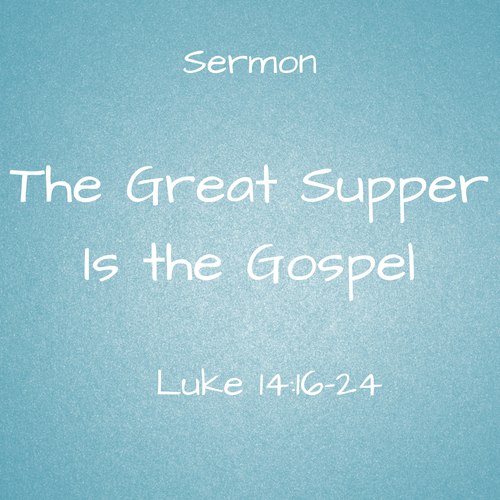 The Gospel invitations are all those predictions and blessings in the Old Testament. People think of the prophets as warning them about their sins, which is true. Those sins - like ours today - came from lack of faith. The condemnations were intended to warn the Jewish people away from all the consequences of their lack of faith, such as chasing after the carnal pagan religions around them. But they were also promised the Messiah, and the people’s response was to get rid of the prophets who annoyed them so much. Who would reject a gracious invitation with such rude, flimsy excuses? And yet they continue to this day. People cite their bad experiences with their parents or a pastor or a denomination, as that mattered in terms of faith in the Savior. Anyone can cite as as many excuses, and pastors can add many more. People should be overwhelmed with gratitude that there are any ministers left who believe in the traditional teaching of the Christian Faith. The modern theologians and the denominational executives are apostates who hate the Christian Faith. More importantly, the greedy, dishonest, and criminal clergy are rewarded for their apostasy and behavior. Those who want the riches and glory of the world, as Jesus was offered in His temptations, are eager to bow down and worship Satan. They will not die for the Faith, but they will kill for their synod's corrupt leaders. The Gospel moves on. As Jesus is teaching in the parable the Gospel invitation was extended to those never considered by Jews to be part of the Kingdom. That would mean us! And now that the West has been rewarded by the blessings of the Gospel, it is moving on among the poorest nations. Sometimes the Word emphasizes works, and at other times faith, but the decisive term in the entire Bible is faith. As the Matthew 7:15ff passage teaches us, the good tree can only bear good fruit, and the bad tree only evil and corrupt fruit. Any gardener can say, the battle against weeds is constant and never won. The weeds grab the good soil, the rain, and the sunshine to overwhelm the good plants. I have roses with grass growing right up through the plant, so I have to cut the grass carefully and deny it sunshine to sprout again. Some weeds are so robust that they grow 9 feet tall, spread out their seeds, dominate the country they adopt, and produce horrible rashes when touched. The believer still has sins, but they do not dominate and destroy, as we see happening with so many today. The unbeliever may strive to show off his great sanctity, but that by itself is an affront to God, as if a human's pretended righteousness is better than God's, which comes from faith in Christ alone. But how shall we be constrained, as God does not want any forced worship? He constrains us by having the Gospel preached to all men: “He that believeth and is baptized shall be saved, but he that believeth not shall be damned.” Here he shows us both heaven and hell, death and life, wrath and grace, and reveals unto us our sins and ruined condition, so that we may be awakened on account of it, because we hear that a man as soon as he is born, naturally belongs to the devil and is condemned. This is part of this constraint, by which one is terrified at the wrath of God and desires grace and help from him. Holy Communion is not abstract, but concrete. It is both symbolic and real at the same time. Holy Communion symbolizes the Last Supper and has us re-enact that pivotal event. Christ instituted it, so the Sacrament is very important. The power of this Sacrament is the Holy Spirit in the Word. What God promises is true - these ordinary elements, consecrated, are also the Body and Blood of Christ, given for the forgiveness of sin. We say Sacrament because Communion combines the Word with earthly elements. Supper is a good term. If we become weak from lacking food, how much more important is it to feed the soul so that we do not become weak in faith? This feast depends on the Word and faith. God has the Word preached to strengthen faith and enjoy the invitation, trusting in the Spirit's work. Notice how powerfully people argue against this - to no avail. The use up 100 times the energy to say this cannot be so and to condemn those who agree with the simple and plain language of Jesus; in the name of the Father, and of the Son, and of the Holy Spirit. Amen.